I took last week off work to start getting our house ready for the market. I worked straight through from last Saturday until last night and I am still not finished, but the house is looking very nice…I don’t think it has been this clean in years! It feels so fresh and bright, and I smile all over inside and out of myself just to look at it. And happy co-incidence, it is International Quilt Day, and so I saved my sewing room for last. Now whether you have a sewing room or not, I know you can easily imagine the constant state of chaos that a sewing room can exist in! Which means you can easily imagine not wanting to wade in and clean up. But it cleaned up beautifully! I even polished the furniture and washed the floor. And do you like my garbage can? It’s a giant crystal vase and I love it! I don’t throw “regular” garbage in it – it sits next to my sewing machine for threads and scraps too small to keep. Special, pretty garbage. I figured it is better to use it for something than to store it “safely” away in the cupboard where nobody ever sees it. Yes, that is a treadmill in my sewing room! Go figure. I watch TV while I walk. Yes, that is my presser foot inside the cupboard. Yes, I stick my foot inside the cupboard to sew. Lol! All quilts personally tested and approved by Samson. Hooking up with SewCalGal’s Virtual Sew-cial. This entry was posted in Balance, Beauty, Quilting, Samson, Stitches and tagged balance, cleaning, fabric, quilting, quilts, Samson, sewing. Bookmark the permalink. 7 Responses to Happy International Quilt Day! Aren’t you clever, putting your foot peddle in the cupboard. 🙂 I have a large vase I got from an aunt maybe I will do something like that with it. I’m delighted to have you join the virtual sew-cial to celebrate International Quilting Day. Fun to see your sewing room, which I think looks great (super organized and cheerful). I like your haiku and the picture at the top of your blog–you look so joyful! Oh, and yes great use for a pretty vase. It would be a shame to hide that away most of the time. 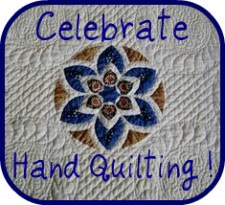 Happy International Quilting day to you too! Samson looks all cozy snuggled in your quilt. Nice to have a quilt tester at home. Thanks for sharing your sewing room, it gives me hope that mine may someday be as neat and tidy! Quilt on, sister!